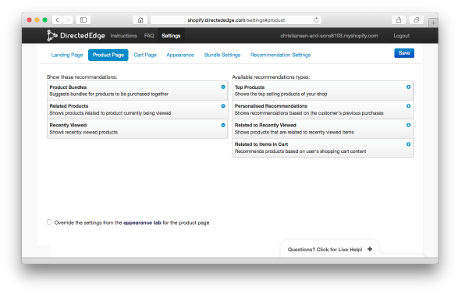 Directed Edge delivers over a million E-Commerce and Social Recommendations per day. Our web services API allows you to add E-Commerce recommendations to your existing shop. We offer language support for PHP, Ruby, Python and Java (along with our generic REST API) to allow you to offer related product and personalized recommendations to your shop's customers. Allows you to add social recommendations to your site such as friend finders, content recommendations and other types of social discovery to your app. As with our E-Commerce API, we offer offer support for several programming languages and a generic REST API. Our plugin for Shopify automatically pulls your shop's data into our recommendations engine and allows you to easily get up and going with sophisticated E-Commerce recommendations.